TurtleSkin SnakeArmor hunting clothing, chaps, and gaiters prevent snake bites and protect from the worst thorns and briars. Our patented 6-oz. fabric is one third the weight of other hunting garments yet strong enough to repel even the bites of large venomous rattlesnakes, copperheads, and cottonmouths. We developed our fabric to be lightweight and flexible so that hunters can easily adapt SnakeArmor to meet the challenges of protection and wearability across all hunting seasons. SnakeArmor protection is available in full-length chaps, below-the-knee chaps, hunting pants, and reversible camouflage gaiters. 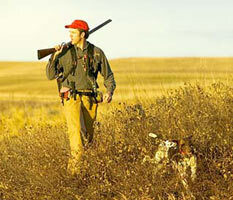 These all-weather, waterproof hunting clothes are ideal for pheasant, turkey, and upland bird and game hunting. Less than a week after buying his TurtleSkin Total Protection Snake Chaps, Ron Dillmon came dangerously close to a large, venomous copperhead snake during a fishing trip. "Here in the mountains of Tennessee, we run across snakes all the time, but the copperheads are extremely aggressive," says Dillmon. "Sometimes if you try to run they'll even chase you, which has happened to me before. Wearing the snake chaps allowed me to stand my ground, and the snake decided to move on. If I hadn't been wearing SnakeArmor I would have been very open to attack, and instead of having an interesting encounter the incident could've been much more serious." Dillmon says he also relies on his TurtleSkin snake chaps to protect him while climbing brush-filled, rocky embankments in order to get to his favorite fishing spots. "While you're on these steep climbs you could be two feet away from a snake and you wouldn't know it," he says. "But now the chaps give me a lot of peace of mind." Ron also uses the snake leggings on his job, a home-renovation business that often involves working under houses to inspect for water damage or repair plumbing. Dillmon says he has encountered many snakes underneath homes, especially in the winter when snakes try to stay warm. "When you're under a house, you never know what you're going to run into," he says.